One year has passed since Hurricane Maria made landfall in Puerto Rico. While it can seem like the conversation begins with Hurricane Maria, Puerto Rico has persistently been subject to hurricane-wrought destruction of this magnitude. Hurricane Maria is not an anomaly in Puerto Rico’s socio-environmental history. Puerto Rico experiences the highest frequency of hurricanes in all of the North Atlantic (Neumann, Jarvinen, & Pike, 1987), as well as being situated in one of the most earthquake-prone regions of the world (Palm & Hodgson, 1993). With this prolonged history of natural disasters, Puerto Rico has remained consistently vulnerable to (re)colonization through environmental calamities. The 8th of August will be a day of terrible memory for Puerto Rico. Before the island had recovered from the state of perturbation and turmoil in with the Spanish-American war left it, and when all its efforts to reconquer its previous normality and prosperity were successively and fatally failing, an extremely violent hurricane hammered the island, intensifying the measure of its pains, immersing it in the most horrendous ruin and destroying the last hope for its salvation and welfare. There only remains of this Antillean isle, once so celebrated for its beauty and fecundity, heaps of rubble spread everywhere, which represent a history full of tears, death, and misfortune for its inhabitants. Puerto Rico is refused a political organization by her new masters [the United States]. She is not even allowed the autonomy that existed under the old regime. The cyclone that has devastated the island is a symbol of the just wrath of God toward the American occupation. This belief in the wrath of God was palpable following San Ciriaco. U.S. aid sent to the island was tinged in anti-Hispanic sentiments and Americanization, namely through the prejudice approach of denying direct aid to avoid supporting “lazy” jíbaros (Schwartz, 1992). This is a narrative that continued with each subsequent hurricane. The scholarly community has extensively examined the history of hurricanes with severe impacts in Puerto Rico (Boose, Serrano, & Foster, 2004; Neumann et al., 1987; Palm & Hodgson, 1993; Rodríguez, 1997), but this history is not as widely recognized outside of these specific scholars and the Puerto Rican community. There is a great deal to unpack in these posts. First, the Reddit comments allude to an already-weakened Puerto Rican infrastructure, brought out not just by natural disasters, but also by the debt crisis and disinvestment. It should be noted that following the socio-ecological history of Puerto Rico, disinvestment has been a common theme. Second, many Puerto Rican Redditors understood what Hurricanes Irma and Maria meant for the island and its infrastructure — the loss of power following both storms was wholly unsurprising. With limited ability to invest in infrastructure, residents reported frequent power outages even before the storms hit. When Hurricane Irma approached, saying nothing of Hurricane Maria, Puerto Ricans on Reddit knew their power would go out, with residents predicting a few days to a few weeks. What was surprising to Puerto Ricans was the time it took to fix the electric grid. Emergency response, overall, was far slower than Puerto Ricans expected. 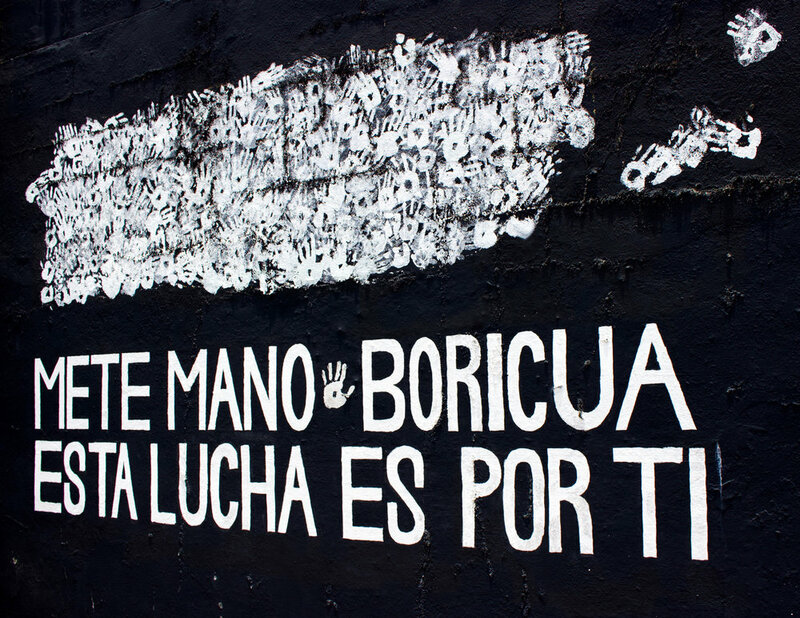 Through coloniality of being, indigenous Borinquen knowledge concerning infrastructure and politics becomes subservient to the Jonathan Katz’s and Naomi Klein’s in disaster literature and services. Not unlike Haiti, Puerto Rican planners were widely cast as incapable of responding to the situation, while localized knowledge was overlooked. This was a problem — I believe many of my peers in planning don’t understand the complex history of Boricua. If they did, they would not be entirely surprised by the results of the hurricane. As a child, my abuelo often spoke to me about a hurricane, San Cipriano II from 1932, that was so powerful, he thought he was going to perish during the storm. In fact, he lost critical documents in that storm, like his birth certificate, which became a rolling joke in the family: “Papá has no mother.” Knowledge of these hurricanes is passed down from generation to generation, but that knowledge is not respected, nor is it being seriously considered outside of the island and its diaspora. The socio-ecological issues facing Puerto Rico did not begin with Hurricane Maria — it currently rests there, but has a longer history. To interrupt the cycle of socio-ecological disaster on the island, we cannot avoid a serious consideration of Puerto Rico’s larger history of environmental disaster-supported coloniality. Instead, examining an historiography of power, relationally considering the recurrences of disaster, will nod towards a solution. Stark, politically-clean mitigation and adaptation will only serve to deepen coloniality of being. Boose, E. R., Serrano, M. I., & Foster, D. R. (2004). Landscape and Regional Impacts of Hurricanes in Puerto Rico. Ecological Monographs, 74(2), 335–352. Maldonado-Torres, N. (2007). On the Coloniality of Being. Cultural Studies, 21(2–3), 240–270. Neumann, C. J., Jarvinen, B. R., & Pike, A. C. (1987). Tropical Cyclones of the North Atlantic Ocean 1871-1986. Asheville, NC. Palm, R., & Hodgson, M. E. (1993). Natural Hazards in Puerto Rico. American Geographical Society, 83(3), 280–289. Rodríguez, H. (1997). A socioeconomic analysis of hurricanes in Puerto Rico: An overview of disaster mitigation preparedness. In H. F. Diaz & R. S. Pulwarty (Eds. ), Hurricanes: Climate and socioeconomic impacts (pp. 121–143). Springer. Schwartz, S. B. (1992). The Hurricane of San Ciriaco: Disaster, Politics, and Society in Puerto Rico, 1899-1901. Hispanic American Historical Review, 72(3), 303–334.